I find it very difficult to make a single layered card, but feel that soft colours works well for this. The tiny hearts are from the Stamp a Bag stamp set - They were heat embossed with Clear Stampin' Emboss powder and Soft Sky ink. For the little heat embossed hearts I first inked with Versamark ink and then Soft Sky ink before I heat set it with Clear Stampin' Emboss powder. This helped to add some dimension. I further added some dimension with Stampin' Dimensionals underneath the vase as well as with a Whisper White ribbon bow. Shape the punched flowers with the back end of a pen in the hollow of your palm (I use the back end of my paper-piercing tool). For some photo's of our camping trip (if you are interested) fo to my Instagram account! Hi Mel, just gorgeous great use of the colours for this design challenge. I love the tiny hearts you have used together with the emboss powder and soft sky ink very subtle but also striking. The punch flowers look great with the daffodil delight. What a fabulous job putting this together quickly in between packing for your camping trip, enjoy your trip. Thank you so much for playing along with this week’s Global Design Project challenge! I love how you have used the colours to make such a beautiful card. Mel - this card is GORGEOUS! I love everything about it. The background is perfectly soft and sweet to showcase this vase of flowers. 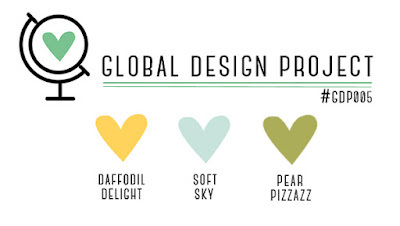 I'm so glad you played along with this week's Global Design Project color challenge! Hi Mel, gorgeous card! Very soft and delicate I love how you have used the embossed hearts, great use of the colours and the punch flowers look great with the daffodil delight. Thank you so much for playing along with this week’s Global Design Project challenge! I look forward to seeing your next design. What a gorgeous card Melodie! I love the background and those sweet flowers! Thank you so much for playing along with this week's Global Design Project challenge! Look forward to seeing you play along with us again. Congratulations on being a winner over at the Global Design Project this week Melodie! Great work. Your card is adorable Melodie, this little flowers on the beautiful background are just adorable x Well done on being one of this weeks winners, please join us again!